Those who follow my work a bit may know that I attach great importance to the ability to step outside of our own experience. This means that we’re trying to take the position of the people we want to reach. We’re trying to see how they view us, how they hear our message. To read more on this, see You are not your audience. It’s not easy to put yourself in other people’s shoes and imagine what it’s like to be them, listening to us. What can help are thought experiments or situations in which someone else is to us what we are to non-vegans. 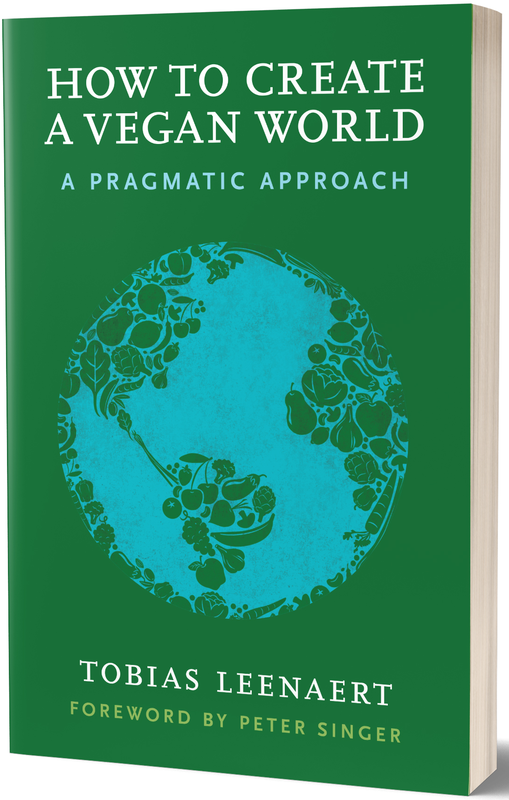 I already wrote about the imaginary superlocavore vegans, who, because they go further than us “common” vegans, may engender in us some of the feelings of guilt, inferiority or accusation that we may cause among non-vegans. Here is a more realistic example of a situation that taught me something about how non-vegans may experience us and our eating habits. Not so long ago, I had people over for dinner who had announced that they were allergic to gluten. I discovered some feelings and thoughts within myself which I thought might be quite similar to the feelings and thoughts that non-vegans have about me – particularly when they’d have me over for dinner. I discovered I didn’t quite know what the gluten-intolerant eat and don’t eat. In spite of being confronted with the word and concept gluten-free like all the time, on product packaging, in restaurants, etc., I did not have sufficient knowledge on the topic to confidently make a glutenproof meal for my guests. I had to look stuff up. I found I was confused by the whole thing and when I googled it, I found terms like gluten sensitivity, gluten intolerance, gluten allergy, celiac disease, etc. Gluten, it turned out, is not just wheat, but also grains like spelt, barley and rye. And what about oats, which are technically ok, but which often get contaminated with gluten. Was this contamination an issue too for my guests, or what? We often raise eyebrows or even poke fun at non-vegans being slow on the uptake and think: “if it comes from an animal, I don’t eat it: is it that difficult to understand?” But maybe it isn’t that easy after all. A gluten intolerant person may wonder just as well: “How many more times do I need to explain this simple concept?” In both the domains of gluten free and animal free, there are different terms, different degrees of strictness, different motivations… It is maybe not as easy to understand as we think it is. I don’t like it when people seem to think I’m requesting a vegan meal for some trivial reason. Sometimes, you can almost see non-vegans think that you’re doing it for the attention, to be special, to be part of the hype. It’s not fun. But I discovered I was doing a bit of the same thing with my guests. Why did they request to eat gluten free? Did they actually have a medical condition? If so, which one? Were they actually harmed by gluten, or was it maybe not all that bad? Or were they perhaps – god forbid – just following a trend? I know, I shouldn’t do this. I should just honor their request. But this was the first time this happened to me, and moreover, I am not in the US, where every single dietary request is treated with the utmost respect. That kind of thing still has to blow over to most European countries. So, forgive me for being a rube here. I quickly went over the staple dishes that I cook for guests, and they all had gluten. I’d have to make something else. That shouldn’t be a big deal, but it was, at least, mildly annoying, and it made me slightly nervous. I couldn’t count on the sure-fire success of my usual concoctions. Somewhere a bit deeper in my mind, I was putting the blame for this, and for the risk of this night not being a culinary success, on them. I was even considering making something separate for them and me (and my girlfriend) so that at least we would have something I knew was going to be good. These are some of the less and more rational, less and more selfish thoughts that went through my head. You may think: but the gluten free thing is so totally different from the vegan thing! In the vegan case, we have those great moral motivations, that very important ethos that people have to take seriously, right? Shouldn’t we just be crystal clear about our intentions, about the non-triviality of our motivations? Shouldn’t we just be unequivocal in our communication and uberconsistent in our behavior? Then, it will all be clear, right? And once it’s clear, our requests will always be honored, without question. Well… I’m not entirely sure. It seems that for many or most non-vegans, it’s very hard to entirely grasp how important exactly those moral motivations are for us. For many, health concerns are easier to take seriously. Think about how the surest way not to get any dairy in your restaurant dish is by announcing you’re lactose intolerant (sure, that has to do with a restaurant’s liability too). But even in those cases, many of us – like bad bad me – may not automatically take people’s dietary requests entirely seriously, and may second guess their guests or customers. And as far as being consistent goes, I can tell you that if my guests would have said “oh, a little bit of gluten here or there doesn’t matter, don’t worry about it,” I would have been appreciative for the break they’d given me, rather than confused. The point of all of this, again, is to imagine ourselves in other people’s shoes. That may increase our understanding of them. And understanding where other people come from will almost always improve our appreciation of and our communication with them. 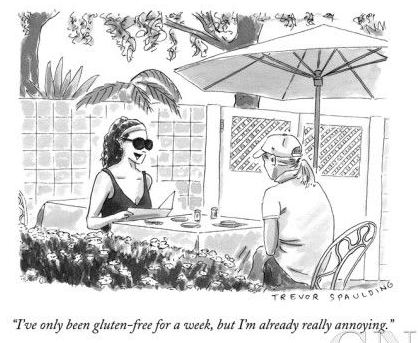 Oh those annoying gluten-free people with their allergies and immune diseases. What a ridiculous article, clearly not stepping in other people’s shoes. The most important difference is that it isn’t a choice for people who suffer physically because of a food type, while I think you’ll find Veganism is a choice. Yes this article particularly angers me because I have Coeliac disease, and I respect other people’s choices of what food they choose to eat. But I do not accept making ridiculous comparisons.